President Trump weighed in on the massive anti-white nationalist protest that took place in Boston on Saturday but it seems he had a bit of trouble getting his thoughts in order. His first instinct? 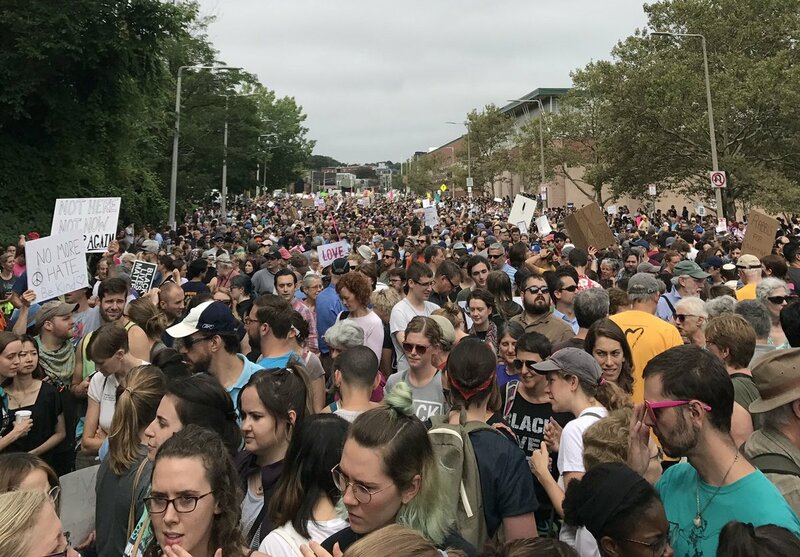 Describe the 40,000 anti-fascist, anti-racist, largely peaceful demonstrators that descended on Boston on Saturday as “anti-police agitators” while law enforcement officers were “looking tough and smart!” Shortly thereafter he sent another tweet in support of the police and even the city’s mayor. Among an estimated crowd of 40,000 protesters there were 27 arrests for disorderly conduct and some for altercations with police. “99.9 percent of the people here were here for the right reasons and that’s to fight bigotry and hate for the most part here today,” Boston Police Commissioner William Evans said at a press conference Saturday. I am convinced that this is not a typo. He doesn’t want us to heal. He wants to us to heel. In order words, to compel us to obey; or to force someone into a submissive condition. This tweet, like 3 others preceding it, all with the spelling of heel, was deleted, as crazed staff finally got the President who has the best words to spell heal correctly. But I believe he truly meant heel, and spelled it that way, three times, while he made other grammatical changes. Remember, he is a dictator in his own mind. He wants us all to bow down to his glorious leadership. Andrew Sullivan: “We know that even Trump’s belief that “fine people” marched alongside Nazi thugs in Charlottesville will not prompt Gary Cohn or James Mattis or Rex Tillerson or Kelly to resign. We know that even in that no-brainer context, almost no Republicans in Congress, including Paul Ryan, will criticize Trump by name. This incident in some ways inoculates Trump. If they let him survive this, they will let him survive anything. Impeachment could make things worse, not better. If Mueller’s final indictment is not tightly connected to the president’s own collusion with Russia, but involves more general criminality in Trump’s business records or coterie, Trump would have an easy case to make to his base, and one he recently dusted off in his West Virginia rally. He could say that the Establishment is out to get him, and that impeachment is simply a way to nullify a fair election. Such a message will resonate. Even if a post-2018 House voted to impeach, I seriously doubt the Senate could find enough Republicans to reach the 66-vote threshold for conviction. David A. Graham at the Atlantic says Donald Trump Is a Lame-Duck President. “Just seven months into his presidency, Trump appears to have achieved a status usually reserved for the final months of a term. Who knows when the lame-duck period began. Was it on January 21, when Trump’s administration tried to argue, against all evidence, that he had the largest inauguration crowd in history? Or the next day, when Kellyanne Conway introduced the world to “alternative facts”? Was it when Trump fired FBI Director James Comey? Was it the days-long slow reveal on Donald Trump Jr.’s meeting with a Russian lawyer in June 2016? Or did it come on Tuesday, when Trump stepped to a lectern in Trump Tower and delivered a strange de facto defense of white nationalism? Erroll G. Southers at USA Today answers President Trump’s request for the facts on right wing extremism. “To further satisfy the president’s sudden desire for fact, it is essential to understand that the road to the Charlottesville attack was not traveled in a night, nor even a decade. Since 9/11, the uptick in terrorism has not come from foreign threats. Instead it is owed to homegrown terrorists, with significant surges in attacks in 2008 and 2012, coinciding with the election and re-election of Barack Obama, America’s first African-American president. Looks like President Trump has decided to break another Washington tradition. On Saturday, the White House said the president and first lady Melania Trump won’t be attending the annual Kennedy Center Honors in December “to allow the honorees to celebrate without any political distraction.” The move comes a few months after Trump decided to skip another tradition and not attend the annual White House Correspodnents’ Dinner. Trump’s just a poor speller, not a subliminal mastermind, he meant heal. Not that it matters. Boston came off without a hitch, suspect other rallies will not. Love the way the residents of Durham, N.C. played the “I am Sparticus!” card and all lined up to turn themselves in. No doubt they’ll be read the standard issue “you’ll regret this” speech, not that they will care. Bannon has gone off to his evil lair at Breitbart but notice advertisers are fleeing, reminds me of Beck, O’Rielly and others but I doubt Bannon will care as he has a billion or so to play with. Noted that the Republicans are cautiously pushing back, they still fear Trump’s base. We shall see as 2018 draws nigh. Would love to hear McConnell speak his mind but it will not happen.